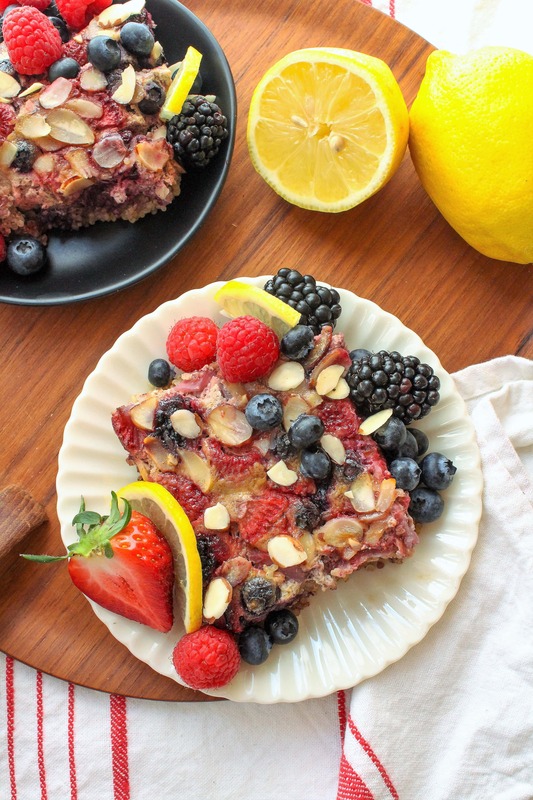 I’m excited to share this fresh and summery Berry Lemon Quinoa Breakfast Bake recipe with you guys today! It’s lemony, bright, and perfect for brunch – give it a shot over the weekend and then enjoy the leftovers all week. 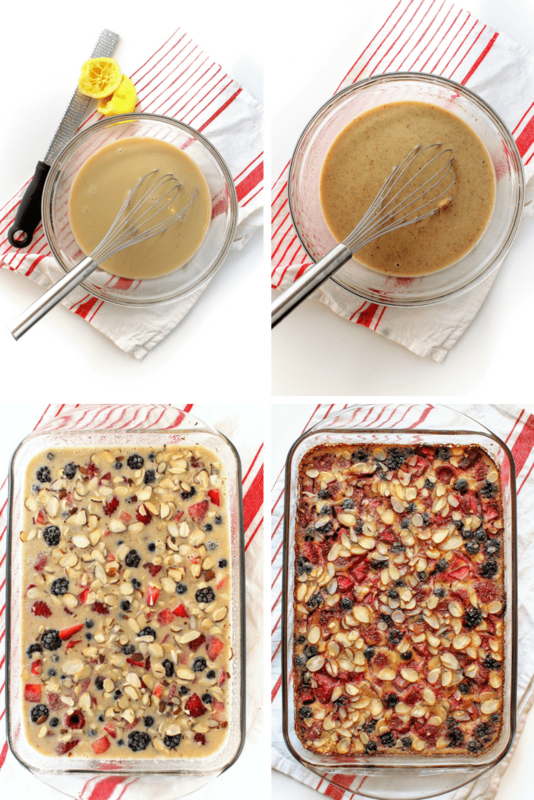 This quinoa bake is a great alternative to baked oatmeal – although I do love my old fave Simple Baked Oatmeal recipe – if you’re looking to mix up your breakfast routine. 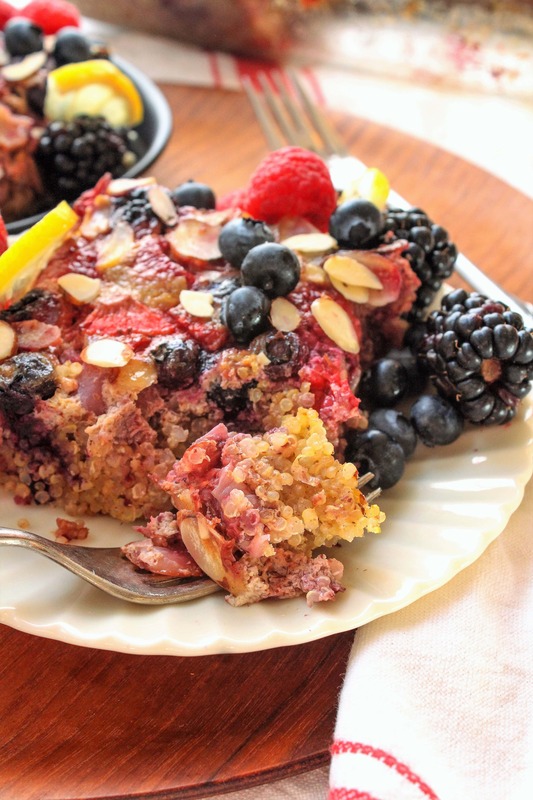 And since quinoa is high in both protein and fiber, this quinoa bake makes for a super filling breakfast or snack. I love how flexible this recipe is, too. During the summer, it’s a great way to use up berries that are on sale (or a great recipe to make after going berry picking! ), but it’s equally great with frozen berries in the winter. It would also be amazing with diced peaches, plums, apples, and more – the options are endless! Similarly, I’ve used both vanilla almond milk and regular whole milk in this recipe and both are tasty – so feel free to use whatever you have on hand. 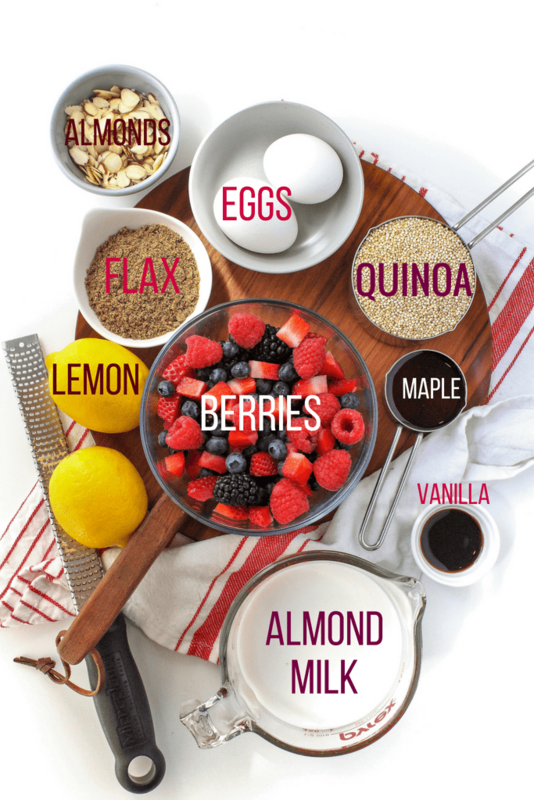 The vanilla almond milk adds a little extra flavor, but the whole milk will add some extra protein! Ground flaxseed can also be replaced by chia seeds, if you like, and you can switch up (or omit) the nut topping as well. I told you – so many possibilities. Get creative, my friends! 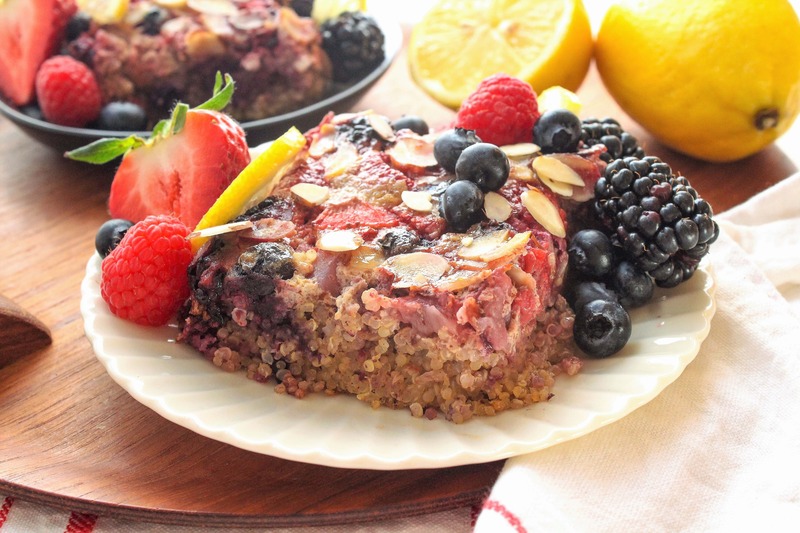 If you’re looking for a baked berry breakfast you can pick up and take with you on the go, you’d be better off with a recipe like my blueberry oatmeal power bites. This baked quinoa holds together enough to cut into slices and eat with a fork, but it’s not dense and heavy. The quinoa cooks up light and fluffy, with bursts of sweet-tart berries throughout. It’s great served warm out of the oven and sliced, mashed with extra milk as a hot cereal, or cold with yogurt or cottage cheese on top! Preheat oven to 375 degrees and grease an 8 x 11-inch baking dish. Whisk together all wet ingredients (eggs through vanilla) in a large bowl. Add the quinoa and flax and stir. Pour the mixture into the greased baking dish, spreading to evenly distribute the quinoa. 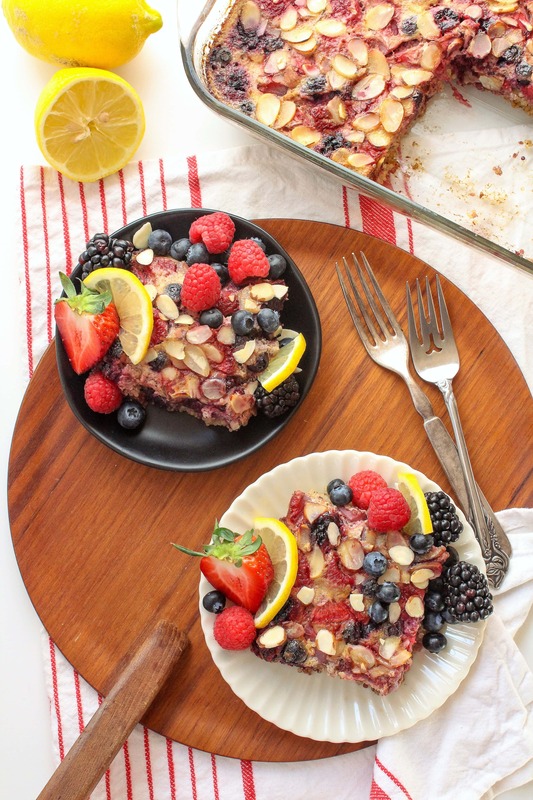 Sprinkle the berries and almonds evenly on top of the mixture. Bake for about 1 hour, until the center is set and doesn't shake when moved. 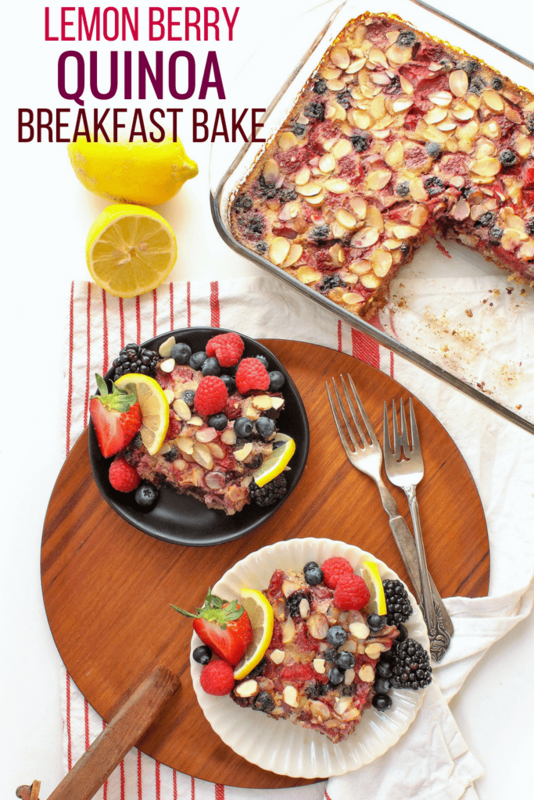 Looking for more breakfast & brunch recipes? Here are some of my favorites! Wow, this sounds amazing!! I just added lemon and quinoa to our grocery list. I can’t wait to make and enjoy this dish soon! Perfect – let me know how you like it! Yay, let me know how you like it/what variations you try! Looks terrific. Can’t wait to try it! Thanks! This looks great! Do you think it would work without eggs, or with an egg replacement? I made this last night for the weekend. It tastes REALLY yummy and smells divine as it bakes. I do have a question. It looks like you used uncooked quinoa. I used the tri-color uncooked and it didn’t really cook. I had to really overbake it. I’m just confirming you did use uncooked. I will experiment with different types of quinoa and also cooking the quinoa first. Do you know if the different types cook differently? Yes, I used uncooked! That’s interesting about the tri-color not really cooking — I have no idea why that would be but maybe it’s a little heartier than the white quinoa I used? Let me know how it works when you try it again with white quinoa – sorry about that! When I was at the store the other day I noticed the bin with white quinoa said “sprouted”. I bought some of that and when I compared it to the tri-color, it looked like it was more puffed. I’m also at high altitude (Santa Fe, NM) so I’m doing more research if that makes a difference. I’ll make it again this coming weekend. I’ll keep you posted. I love your recipes and have incorporated many them into our diet. I love they don’t take hours, use real food and are so yummy. I made this recipe today. I used only blueberries, replaced a bit of the maple syrup with half a banana and left out the lemon. It did not look at all pretty like yours, but it tasted delicious. My 1.5 and 4 year olds enjoyed it too! Yay, I’m glad it was a hit!